A new restaurant in the Austin area is garnering rave reviews, and after dining there recently, I can see why. 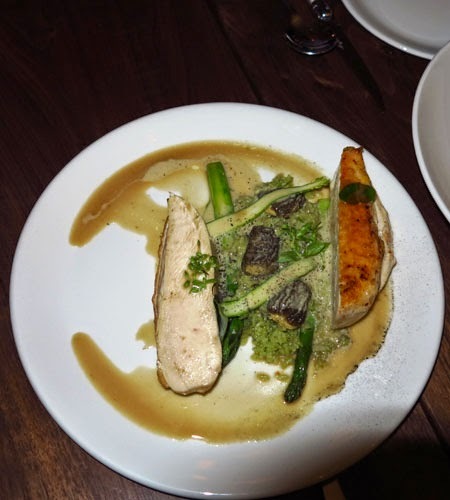 Apis Restaurant and Aviary is hitting the five star mark with delicious food and superb service. allows patrons to enjoy pleasant central Texas weather.. 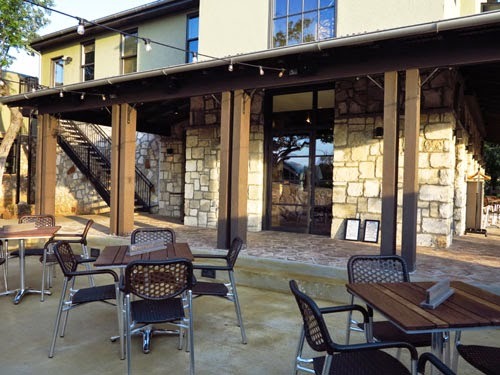 Located on a six-acre plot on the banks of the Pedernales River in Spicewood (less than an hour by car from downtown Austin, west on Hwy 71) Apis opened in early February 2015 and has wowed the foodie crowd since then. Owners Casie and Taylor Hall have lived in Spicewood since 2008 and kept bees at their home. So, when they found the perfect spot to build their restaurant, it was natural to place hives there and to infuse the honeycomb theme into the building’s interior design (for starters, check out the ceiling, wall décor, and light fixtures) as well as using honey in many of the dishes they serve. Honey from their 20 hives has become an important ingredient in the restaurant, and they plan to bottle and sell the excess. In keeping with their natural theme, they hope to add a small chicken coop and a garden with edible flowers and vegetables. 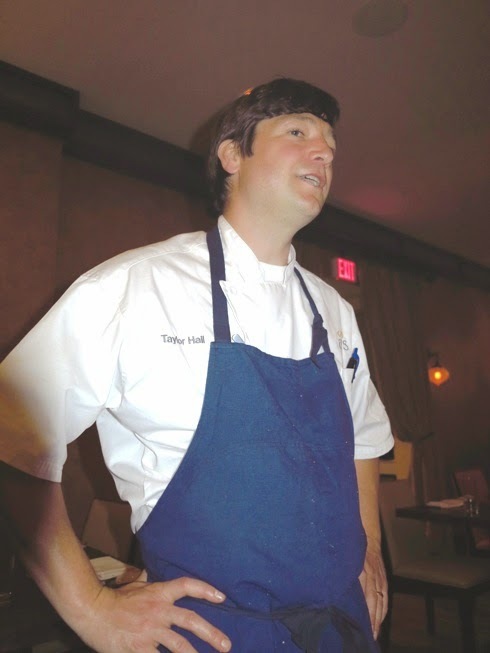 Local farms provide much of the produce used in the restaurant. A cocktail at the bar is a great way to start your meal. I ordered the Aviary ($12), a signature honey-infused whiskey cocktail. 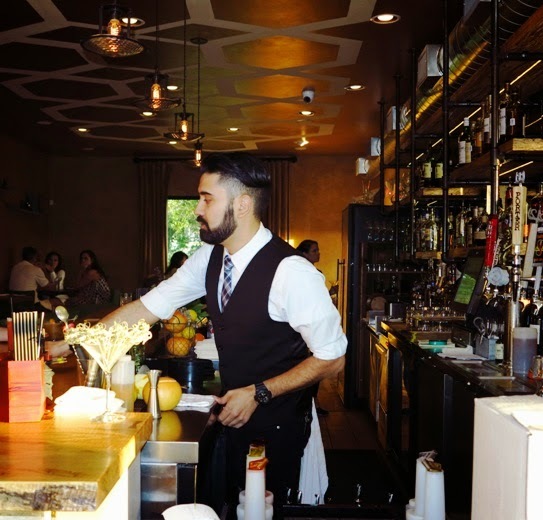 Beverage director Jose Sapien has created all the craft cocktails on the menu including Texas-inspired drinks like the Wildflower (with Waterloo gin and grapefruit) and Hill Country (featuring vodka in a martini-style drink). “Part of my job is to be a chemist while I play with alcohol,” Sapien said regarding his novel drink creations. Wines by the glass range from $10-13. The bar menu offers appetizers like fried cauliflower ($6) and roasted chicken thighs ($18). We sampled a variety of dishes in the dining room, starting with one of my favorites: warm buttermilk biscuits served with whipped honey butter and bee pollen. They really do melt in your mouth. Appetizers included innovative dishes featuring oysters, salmon belly, wild pork, egg toast, and crispy chicken skin. Just listing the main ingredient doesn’t do it justice, however, as the preparation renders each item unique and delicious. Flounder crudo, tuna, foie gras Terrine, and spring pea soup are other beautifully plated offerings from Taylor and the kitchen staff. Small plates with seasonal Louisiana crawfish, salmon, chicken breast, Colorado lamb, turbot (a mild white fish) and 40-day aged beef further tempted our palates. Even though we were fully satisfied by this time, desserts were too tempting to pass up. Fresh fruits were the basis for roasted pineapple and poteet strawberry dishes, but the absolute piece d’ resistance was the house-made honey bun with horchata ice cream. It’s to-die-for! Now, all that kitchen expertise and style doesn’t come cheap, but if you’re celebrating a special occasion, want to impress visitors, or just appreciate fine food, this is the place to go.